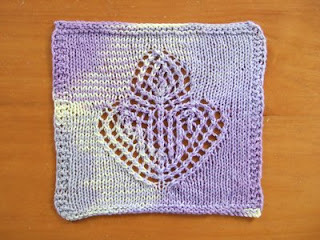 Here's another lace cloth. I know most people prefer the solid fabric cloths, but as you can see, I really love lacy cloths! And they also tend to work well with variegated yarn. That's a plus cuz I picked up a lot of variegated yarn before I realized that I could do more with the solids. 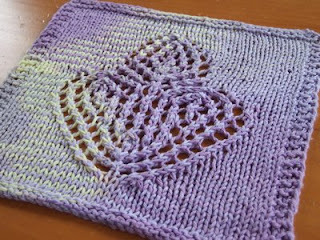 This cloth is inspired by BW3 p170, and is knit in S&C Spring Swirl. I thought it was neat how most of the yellow in this variegated yarn ended up on the left side of the cloth. This is definitely different from the usual zig-zag color pooling I get with many of the variegateds. Flacon Cloth pattern can be downloaded from Smariek Knits Yahoo Group. 10/12/07 Update: Trying something new here to improve pattern distribution. Flacon Cloth pattern can also be downloaded by clicking on this link: http://www.box.net/shared/i8fceack8j . No registration required for this link.. Note: Pattern was updated on 11/7/07 to fix typos. Thanks Candice for spotting them! your lace clothes are beautiful I will go to Ravelry and pick more as my favorites, You need to pick favorites too!!! I know the page says underconstruction but it works If you find something you like and click on it there is a bar in the upper right that you can click and it will appear in your favorites page, its fun selecting the awesome knitting thats being done!